M’Ocean Grant’d is a 31 foot Ocean Master Center Console with Twin 250hp Suzuki 4 Stroke engines. It was built in 2004, the engines are 2008, but has completely refitted with state of the art Garmin electronics in 2011, including chat plotters, radar and gigantic commercial grade transducer. The R111 transducer with CHIRP technology allows us to clearly see bait and target species in depts. Up to 5,000.00 feet. With the latest Garmin technology we have the ability to not only see what is below us but also what is around us and in front of us. That’s 360 degree of fish finding ability! It has a wide 11’ beam leading to supreme stability and comfort while fishing and cruising. It has the ability to hold 10 fully rigged fly rods or 15 rigged regular rods plus a gaff. 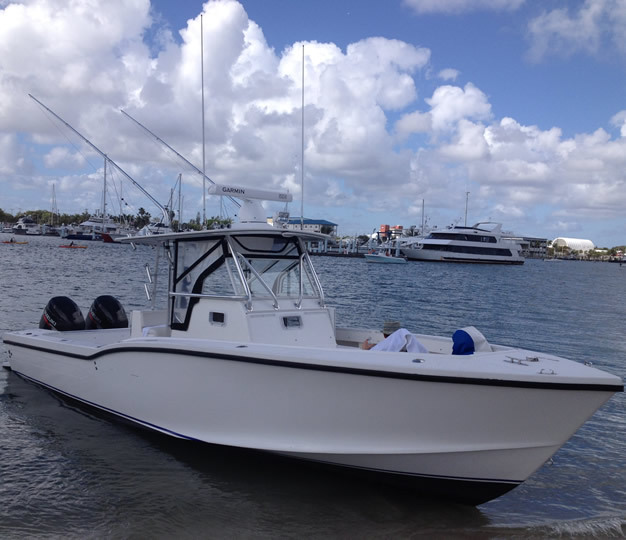 It can comfortably fish four anglers plus the Captain. Naturally, the boat is outfitted with a large bait well to keep live bait fresh, a large cooler for cold drinks and food as well as a HUGE fish box for storing the days catch. The console has a stand up head and can hold even the largest of luggage and provides easy access to all the electronics and equipment. She holds 300 gallons of fuel giving us a range of approximately 500 miles.